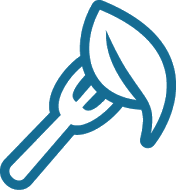 Rumba Cuban Cafe is known for serving the most authentic and highest rated Cuban fare in Naples at their original location. This new location in North Naples specializes in a paired down menu of all the best Cuban appetizers, sandwiches, salads and sides. Also known a Media Noche. Has a layer of roasted pork, ham, Swiss cheese, mustard and pickles on sweet bread. 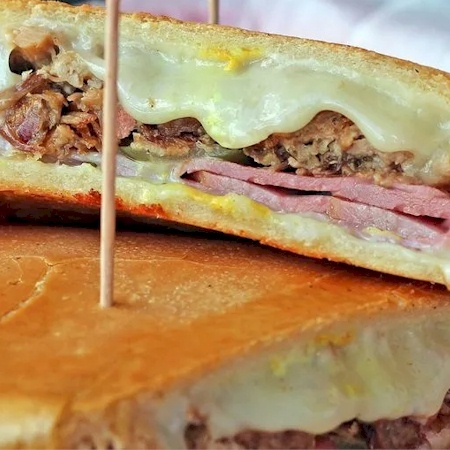 Cuban sandwich with ham and a layer of roasted pork, Swiss cheese, mustard, mayonnaise, and pickles. Choose half or whole sandwich. Ripe plantains sliced and fried until dark. This sweet favorite is a nice addition to any meal. Ham Croquteas that are breaded and fried until golden brown. Served as an order of four. Also known as Pan Con Bistec is a palomilla steak topped with grilled onions, tomato and potato sticks. 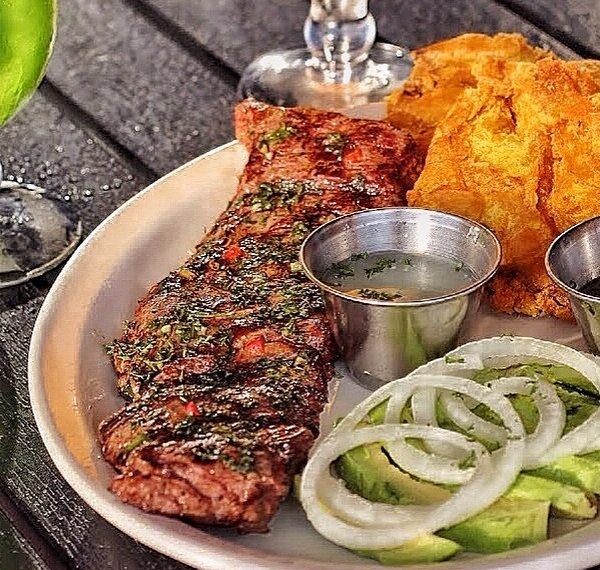 Perfectly seasoned churrasco steak is grilled to bring out mouth watering flavors then topped with our homemade chimichurri sauce. Served with your choice of two sides. Boneless chicken breast, butterflied thin and marinated in our mojo sauce. Seared and topped with grilled onions. Served with your choice of two sides. Fresh mixed greens with tomato, cucumber, onions, carrots and Swiss cheese. Succulent Chicken Breast over delicious Beans & Rice w/ Sweet Plantains. Slow marinated chicken breast sliced over fresh greens, tomato, carrots, cucumber, onions and Swiss cheese. Hand rolled traditional Spanish Style Tamale topped with chopped onions. Thin sliced, fried green plantains (Tostones) served with your choice of beef or pork. Fresh greens uniquely topped with sliced chorizo and pork, with tomato, cucumber, carrots, red peppers, onions and peas. Marinated chicken breast topped with tomato, onions and potato sticks. Slow roasted pork sandwich with grilled onions. Han croquetas and Swiss cheese, served on Cuban bread. 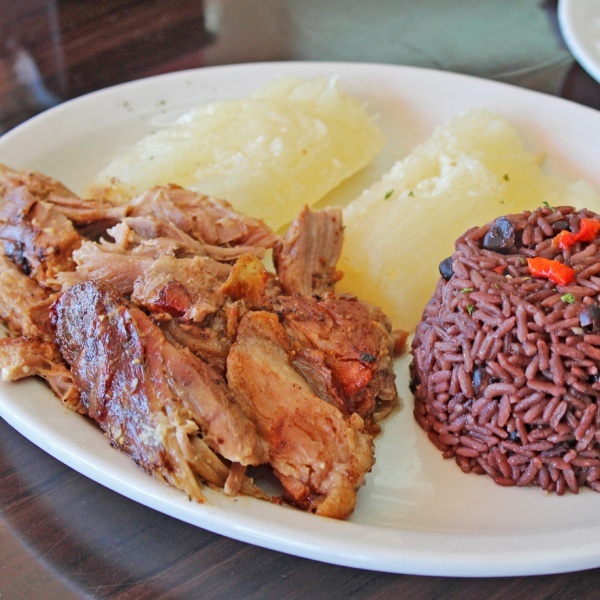 This house favorite and traditional Cuban dish is succulent slow roasted pulled pork gently marinated in mojo. Close your eyes and we will make sure you visit Cuba! Served with your choice of two sides. Marinated in the fusion of ingredients like garlic, sour orange, lime, oregano also known as mojo sauce, seared on the grill. Topped with grilled onion. Served with your choice of two sides. Marinated chicken breast. Topped with tomato, onions, and potato sticks. Choose half or whole sandwich. Succulent half chicken is roasted then flash fried to seal in flavor. Quickly grilled and basted in mojo sauce. Served with your choice of two sides. Also know as pan con bistec is a Palomilla steak. Topped with grilled onions, tomato, and potato sticks. 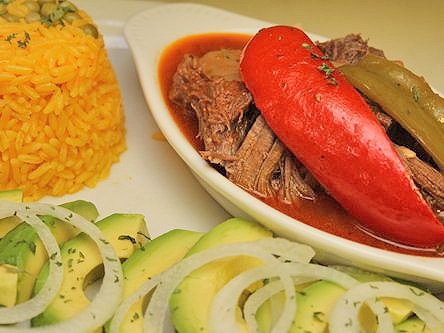 Spanish for old clothes is a traditional Cuban dish consisting of stewed flank steak in a light tomato sauce. Served with your choice of two sides. Moist and delicious roasted pulled pork over fantastic Beans & Rice w/ Sweet Plantains. Succulent Picadillo (Ground Beef) over delicious Beans & Rice w/ Sweet Plantains. Ropa vieja (shredded beef) over delicious beans and rice with sweet plantains. Lettuce, tomato, cucumber, carrots and onions. Beans and rice cooked together letting all the spices fuse to create this excellent combination. This potato like side is boiled until soft then covered in Mojo sauce, topped with grilled onions. Crunchy, fried version of boiled yuca. Served with Mojo. Gold and crunchy plantains that have been sliced, cooked, then smashed and fried until golden brown. Served with Mojo. Translated as "Three Milks" this unique moist cake is soaked in sweet creams, topped with icing. Sweet homemade Cuban dessert is hand rolled then fried and topped with special anise sauce. Choose from Iron Beer, Materva, Jupiña, Kern's Guava Nectar, or Kern's Mango Nectar.